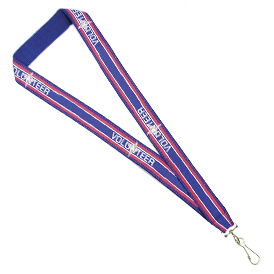 Our sewn on fine woven lanyards feature a single woven design sewn onto the lanyard fabric. This process can capture fine detailed artwork while maintaining an embroidered look. 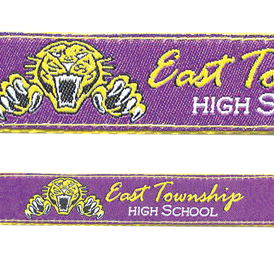 1 color woven design sewn on 1 side of lanyard. Imprint size: Width minus 1/4". The 3/4" width lanyard is available in 7 stock colors. Click here to view 3/4" stock colors For other lanyard widths add 26.00 (G) for a custom PMS color if order is less than 1,000 pieces. For custom PMS lanyard colors on orders of 1,000 pieces and under, add 26.00 (G). No charge for a custom PMS colored lanyard if order is 1,000 pieces or more. 5 weeks from artwork or sample approval.